In March 2016, AMECO successfully assisted Visy Pulp with the replacement of the main slewing ring on one of the three AMECO Circular Storage Systems handling woodchips at Visy Pulp’s plant in Tumut, NSW – Australia. 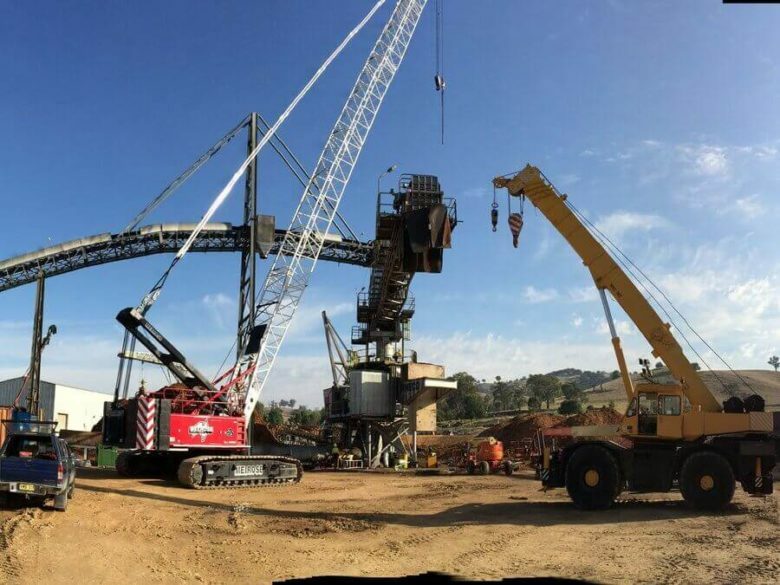 The three AMECO circular stacker/reclaimer machines located in Tumut, Australia have been in continuous operation since they were commissioned in 2000. The central slewing ring is a critical part that allows the rotation of the reclaimer arm and due to it’s position on the central column, supports the entire weight of the upper structure of the stacker/reclaimer, a total load of >40 tons. The replacement of this slewing ring required disassembly of the stacker boom and the upper part of the central tower, which gave our technical specialists the opportunity to closely inspect and re-adjust all the elements of the machine. AMECO’s maintenance teams are always available to our clients for inspections of installed machines, and can often propose improvements that will benefit the daily operations of the plant and extend the life expectancy of AMECO systems.